The first time I was asked to "pass the gravy" during dinner with my childhood friend's Italian-American family, I searched frantically for the lumpy, brown stuff we serve at Thanksgiving. After getting a graceful nudge toward the meat sauce from my dear friend, I realized my error. For those of us that didn't grow up with an Italian 'Nonna' (or did not watch last week's Jersey Shore), Italian-Americans frequently refer to meat sauce as gravy. The closest thing I have to a Nonna is Lidia Bastianich. And the closest thing I have to Nonna's Sunday gravy is her recipe for Ragu alla Bolognese, which can be found in her cookbook, Lidia's Family Table. She explains bolognese as a traditional Sunday staple in Italy, which has two distinct versions: one with milk, referred to as 'antica', and one without, called 'tradizionale'. I chose to prepare the antica, where the milk solids help break down the meat, allowing it to have a smoother, creamier texture. I gave it my own twist by adding bay leaves while the sauce was simmering and by using red wine to moisten the meat instead of white, as that is what was leftover from Saturday night. 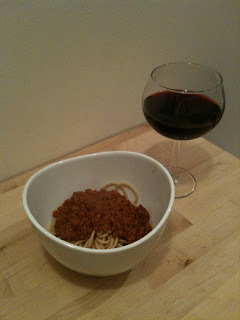 I also chose to serve my bolognese on top of whole wheat spaghetti rather than tagliatelle, as suggested. A third trip to the grocery store wasn't happening in this cold. The recipe took about five hours, start to finish, an admittedly large time commitment, but the end result was well worth the wait. It was also much simpler to prepare than I thought, the only difficulty being the time and patience it calls for. It's nothing a good book, a stool, and substitute stirrer can't remedy. This recipe makes a boatload of sauce, perfect for storing in the freezer and great for another helping over gnocchi or a filling for lasagna. Whether you call it sauce, gravy, ragu, or sugo, there is something inherently comforting about an aromatic pot of red sauce bubbling away on the stove during the day of rest. So unless you have an Italian Nonna at hand (you lucky dog), I suggest you try Lidia Bastianich's Ragu alla Bolognese this winter. Not a cook? Treat yourself to Lidia's pappardelle ragu at her restaurant in midtown east, Felidia. Reservations a must. 2 cups of broth (beef, chicken, or veg. I prefer low sodium to control the salt) Heated. Break up and mix together ground beef and pork in a large mixing bowl. Pour over wine and mix in with fingers to ensure it's evenly moistened. Roughly cut pancetta into 1 inch slices and place in a food processor with peeled garlic. Process into a fine paste (this is called a pestata). In a large saucepan or Dutch oven (6-quart capacity), pour olive oil and scrape in the pestata. Place over medium/high heat and break up with a spoon to render the juices. Once the pestata is sizzling away and is very aromatic, stir in the minced onion for a few minutes until they start to sweat. Now add your minced carrots and celery, stirring until they're all wilted and golden, about 5 minutes. Turn the heat up a bit, push the vegetables to the side and add your meat mixture to the pan, giving it a few moments to caramelize and brown on the bottom of the pan before mixing in with the vegetables. Cook on high heat, stirring frequently, for ab.out 30-45 minutes, until all all of the liquid has disappeared. Begin heating up your liquids (milk, broth) for the next steps. Once again, push aside your meat/vegetable mixture and create a hole to place the tomato paste so it can lightly toast. Cook for another 2-3 minutes. Pour in 2 cups of hot milk and stir into the meat mixture, making sure to scrape any brown bits off the bottom of your pan. Now grate the nutmeg into the pan. Bring the sauce to a slow, steady simmer, consistently bubbling away on all surface area. Cover and let cook for at least 3hrs, checking and stirring about every 20 minutes. Use hot broth to maintain the sauces liquid levels throughout cooking. To finish the sauce, uncover and allow sauce to simmer itself into a thicker, pudding-like consistency. Add salt and pepper to taste at this point, allowing at least 5 minutes of additional cook time for the spices to distribute. Fish out your bay leaves and if desired, spoon off any access fat if using right away. If storing, leave the fat on to protect the sauce, spooning it when it's cold, before use. 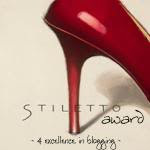 Carrie R. from your book group shared your address with me (I also write a food blog). I love your idea of providing customized dining suggestions to people! And the recipe for Lidia's (whose show is on my TV as I type, btw) sauce sounds amazing! Love you apron...your "Non" Nonna..... but you did grow up with some good Italian food- no Ragu for us! 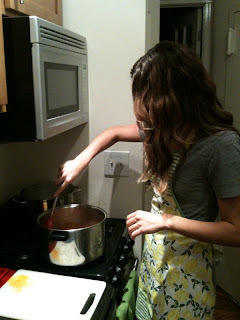 Just read the blog and responses... MamaIss took the words right out of my mouth... sweet apron! Looking forward to making this ragu for sure. I love Lidia! There seems to be a typo here, however. 8 Cups of milk is listed in the ingredients while only 2 are mentioned in the directions. 8 cups seems like way too much, so I'll assume that the correct amount is 2, right?? Yes 2 cups - thank you for pointing that out! I'm having the leftover bolognese this week in a lazagna I spotted on seriouseats.com: http://bit.ly/bQMFoz I'm sure you'll have leftovers! Recipe sounds wonderful, thanks! I am formerly from NY (Queens) and now live in North Carolina. Myself and my 3 sons launched a fiery food product that I would like you to try. There is NOTHING like this on the market. Several chefs, who have tasted Vesta, call it a dry salsa. It comes in Hot and Very Hot and is basically something that you sprinkle onto food. It is made from chiles, onion and bread crumb. Our default slogan, from people that use it, is "I put this s$#@ on everything". Let me know if you would like to try it. Lidia's recipe calls for 8 (eight) cups of milk added in 2 cup intervals about every half hour as the liquid cooks down. The sauce simmers for three hours. You'll need all 8 cups and maybe some additional water or broth.